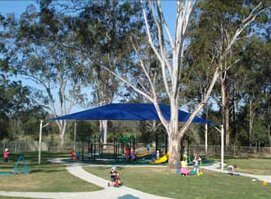 Kids love being outdoors and exploring their natural surrounds, and at our Bushkidz Brassall early learning centre, we are proud of the safe, engaging, and interactive outdoor space that we have available. Our outdoor environment consists of wonderful learning experiences which allow the children to explore their surroundings. With access to obstacle courses, forts, individual and group experiences, and bikes. The outdoor environment allows for as many wonderful learning opportunities for children of all ages. When kids are exploring the outdoor play areas, they are developing a range of new skills. 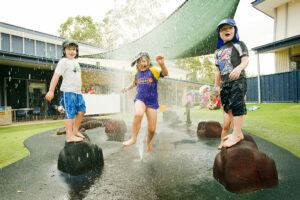 Through outdoor play at our Bushkidz Brassall early learning centre, Kids develop increased confidence. They’re also able to release their high amount of energy effectively, by having a lot of space to run, climb and play in. All children are encouraged to use their imaginations to grow and learn through their senses as they explore. Creativity and imagination are both fostered as kids can interact meaningfully with their surroundings, while at the same time learning about responsibility and consequences in a safe and beneficial way. Children experience a range of new stimulus when they are outdoors, which results in a richer learning experience overall.